Why Would You Buy A Presale Condo? What is a Presale Condo? It is buying the right to purchase a brand new home in a new development. The purchaser pays the deposit and is obligated to purchase the home when it does complete (is built). Deposits can range from 5-10% initially, and then another 10- 15% through the construction process, depending on the development. However you will not have to secure the mortgage until after the property has been completed. This money is held in the developers trust account until completion, they will not have access to the funds before it. 2. Customize your new home before it is built, it may be easier to do while it is being constructed. 3. New condos built by a reputable developer, will have the 2-5-10 New Home Warranty. Since the entire building is under warranty, there won’t be any serious structural costs for many years. This is some great risk mitigation. 4. Maintenance fees will likely remain quite low as compared to many older building who have needed some work done to them. 5. New homes are coveted by potential tenants and will garner a much higher rent from these prospective tenants, which is a great reason for investors to buy Presale Condos. There are many great reasons to purchase a presale condo, I would be delighted to speak to if you have any questions on a particular presale or the process of purchasing a presale condo. Sign up to become a VIP Presales Member. Get VIP Exclusive access to The Jervis! Fast track to the front of the line! Sign up for to be on the VIP list for Pre-Sales Members Service. Through our relationships with Developers and the Marketing teams that sell these NEW HOMES, we have the inside track and can get you the best homes offered for sale before anyone else! Our team specializes in getting you the Pre Sale property you want you want without having to line up. We provide you with all the information you need, VIP access before they are offered to the public for sale. We are also privy to getting a few added benefits that come along with being a VIP, but most importantly you will get EARLY ACCESS. When you are one of our esteemed VIP Pre Sale Clients we at Ball Real Estate will be working for you, as your agent, making sure you get the best deal possible. We don’t work for the Developer, we owe you a duty of Care and Service; built on TRUST, KNOWLEDGE, and PROVEN RESULTS. VIP Access to The Jervis! View this luxury development before anyone else and gain the Insider Advantage for the sophisticated buyer or investor. Intracorp and Inform have joined forces to bring you The Jervis. The Jervis will offer perfectly formed and carefully crafted homes, built by design and made for living. 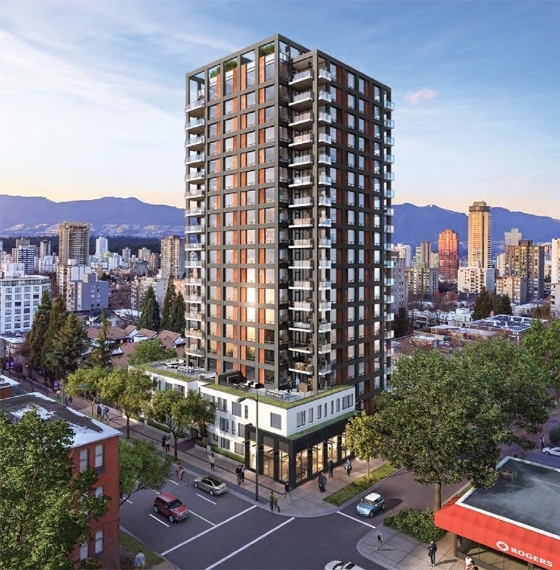 Located right on the corner of Jervis and Davie St, this development allows you to be in the mix of the lively downtown area while being only a short walk to beautiful English Bay. The building itself will consist of 19 storeys with mixed dwellings. With one level reserved for commercial units, the remaining space will be filled with 63 market units and 28 social housing units. Don't miss this opportunity to beat the lines and get exclusive VIP access to this development as well as agent exclusive bonus upgrades and rewards.